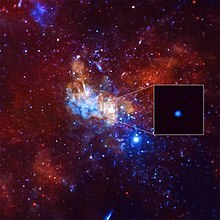 ^ For a photo see: Sagittarius A*: Milky Way monster stars in cosmic reality show. Chandra X-ray Observatory. Harvard-Smithsonian Center for Astrophysics. 2003-01-06 [2012-05-20]. （原始内容存档于2008-03-17）. ^ 1.0 1.1 Gerhard, O. Mass distribution in our Galaxy. Space Science Reviews. 2002, 100 (1/4): 129–138. Bibcode:2002astro.ph..3110G. arXiv:astro-ph/0203110. doi:10.1023/A:1015818111633. ^ Frommert, Hartmut; Kronberg, Christine. Classification of the Milky Way Galaxy. SEDS. 2005-08-26 [2015-05-30]. ^ Hall, Shannon. 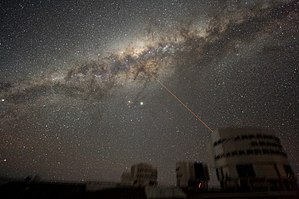 Size of the Milky Way Upgraded, Solving Galaxy Puzzle. Space.com. 2015-05-04 [2015-06-09]. ^ 4.0 4.1 Coffey, Jeffrey. How big is the Milky Way?. Universe Today. [2007-11-28]. （原始内容存档于2013-09-24）. ^ 5.0 5.1 Rix, Hans-Walter; Bovy, Jo. The Milky Way's Stellar Disk. The Astronomy and Astrophysics Review. 2013, 21. Bibcode:2013A&ARv..21...61R. arXiv:1301.3168. doi:10.1007/s00159-013-0061-8. ^ NASA – Galaxy. NASA and World Book. Nasa.gov. 2007-11-29 [2012-12-06]. （原始内容存档于2009-04-12）. ^ Staff. How Many Stars are in the Milky Way?. Universe Today. 2008-12-16 [2010-08-10]. （原始内容存档于2010-05-02）. ^ Odenwald, S. Counting the Stars in the Milky Way. The Huffington Post. 2014-03-17 [2014-06-09]. （原始内容存档于2014-08-01）. ^ 9.0 9.1 H.E. Bond; E. P. Nelan; D. A. VandenBerg; G. H. Schaefer; 等. HD 140283: A Star in the Solar Neighborhood that Formed Shortly After the Big Bang. The Astrophysical Journal. 2013-02-13, 765 (1): L12. Bibcode:2013ApJ...765L..12B. arXiv:1302.3180. doi:10.1088/2041-8205/765/1/L12. ^ 10.0 10.1 10.2 McMillan, P. J. Mass models of the Milky Way. Monthly Notices of the Royal Astronomical Society. July 2011, 414 (3): 2446–2457. Bibcode:2011MNRAS.414.2446M. arXiv:1102.4340. doi:10.1111/j.1365-2966.2011.18564.x. ^ Kafle, P.R. ; Sharma, S.; Lewis, G.F.; Bland-Hawthorn, J. Kinematics of the Stellar Halo and the Mass Distribution of the Milky Way Using Blue Horizontal Branch Stars. The Astrophysical Journal. 2012, 761 (2): 17. Bibcode:2012ApJ...761...98K. arXiv:1210.7527. doi:10.1088/0004-637X/761/2/98. ^ 12.0 12.1 12.2 Kafle, P.R. ; Sharma, S.; Lewis, G.F.; Bland-Hawthorn, J. On the Shoulders of Giants: Properties of the Stellar Halo and the Milky Way Mass Distribution. The Astrophysical Journal. 2014, 794 (1): 17. Bibcode:2014ApJ...794...59K. arXiv:1408.1787. doi:10.1088/0004-637X/794/1/59. ^ Karachentsev, Igor. Double Galaxies §7.1. ned.ipac.caltech.edu. Izdatel'stvo Nauka. [2015-04-05]. ^ 14.0 14.1 14.2 Gillessen, S.; 等. Monitoring stellar orbits around the massive black hole in the Galactic Center. Astrophysical Journal. 2009, 692 (2): 1075–1109. Bibcode:2009ApJ...692.1075G. arXiv:0810.4674. doi:10.1088/0004-637X/692/2/1075. ^ 15.0 15.1 Sparke, Linda S.; Gallagher, John S. Galaxies in the Universe: An Introduction. 2007: 90. ISBN 9781139462389. ^ 16.0 16.1 Gerhard, O. Pattern speeds in the Milky Way. arXiv:1003.2489v1. ^ Kogut, A.; 等. Dipole anisotropy in the COBE differential microwave radiometers first-year sky maps. The Astrophysical Journal. 1993, 419: 1. Bibcode:1993ApJ...419....1K. arXiv:astro-ph/9312056. doi:10.1086/173453. 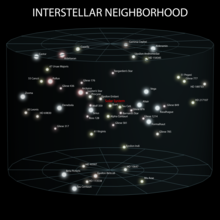 ^ Our Solar System: Overview: Our Galactic Neighborhood. NASA. （原始内容存档于2016-11-27）. ^ Elizabeth Howell. How Big Is The Milky Way?. Universe Today. 2015-01-20. （原始内容存档于2014-10-15）. ^ 21.0 21.1 Mary L. Martialay. The Corrugated Galaxy—Milky Way May Be Much Larger Than Previously Estimated (新闻稿). Rensselaer Polytechnic Institute. 2015-03-11. （原始内容存档于2015-03-13）. ^ Milky Way. BBC. （原始内容存档于2012-03-02）. 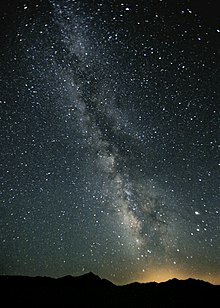 ^ How Many Stars in the Milky Way?. NASA Blueshift. （原始内容存档于2016-01-25）. ^ 24.0 24.1 24.2 Cassan, A.; 等. One or more bound planets per Milky Way star from microlensing observations. Nature. 2012-01-11, 481 (7380): 167–169. Bibcode:2012Natur.481..167C. PMID 22237108. arXiv:1202.0903. doi:10.1038/nature10684. ^ 25.0 25.1 Staff. 100 Billion Alien Planets Fill Our Milky Way Galaxy: Study. Space.com. 2013-01-02 [2013-01-03]. （原始内容存档于2013-01-03）. ^ Koupelis, Theo; Kuhn, Karl F. In Quest of the Universe. Jones & Bartlett Publishers. 2007: 492; Figure 16-13. ISBN 0-7637-4387-9. ^ Laniakea: Our home supercluster. youtube.com. （原始内容存档于2014-09-04）. ^ Tully, R. Brent; 等. The Laniakea supercluster of galaxies. Nature. 2014-09-04, 513 (7516): 71–73. Bibcode:2014Natur.513...71T. PMID 25186900. arXiv:1409.0880. doi:10.1038/nature13674. ^ Pasachoff, Jay M. Astronomy: From the Earth to the Universe. Harcourt School. 1994: 500. ISBN 0-03-001667-3. ^ Rey, H. A. The Stars. Houghton Mifflin Harcourt. 1976: 145. ISBN 0395248302. ^ Pasachoff, Jay M.; Filippenko, Alex. The Cosmos: Astronomy in the New Millennium. Cambridge University Press. 2013: 384. ^ Crumey, Andrew. Human contrast threshold and astronomical visibility. Monthly Notices of the Royal Astronomical Society. 2014, 442: 2600–2619. Bibcode:2014MNRAS.442.2600C. arXiv:1405.4209. doi:10.1093/mnras/stu992. ^ Steinicke, Wolfgang; Jakiel, Richard. Galaxies and how to observe them. Astronomers' observing guides. Springer. 2007: 94. ISBN 1-85233-752-4. （原始内容存档于2016-11-20）. ^ Falchi, Fabio; Cinzano, Pierantonio; Duriscoe, Dan; Kyba, Christopher C. M.; Elvidge, Christopher D.; Baugh, Kimberly; Portnov, Boris A.; Rybnikova, Nataliya A.; Furgoni, Riccardo. The new world atlas of artificial night sky brightness. Science Advances. 2016-06-01, 2 (6): e1600377. ISSN 2375-2548. PMC 4928945. PMID 27386582. doi:10.1126/sciadv.1600377. （原始内容存档于2016-07-11） （英语）. 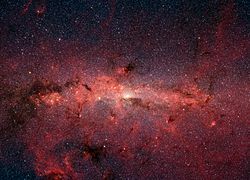 ^ How Big is Our Universe: How far is it across the Milky Way?. NASA-Smithsonian Education Forum on the Structure and Evolution of the Universe, at the Harvard Smithsonian Center for Astrophysics. [2013-03-13]. （原始内容存档于2013-03-05）. ^ Newberg, Heidi Jo; 等. Rings and Radial Waves in the Disk of the Milky Way. The Astrophysical Journal. 2015-03-01, 801 (2): 105. Bibcode:2015ApJ...801..105X. arXiv:1503.00257. doi:10.1088/0004-637X/801/2/105. ^ Vayntrub, Alina. Mass of the Milky Way. The Physics Factbook. 2000 [2007-05-09]. （原始内容存档于2014-08-13）. ^ 39.0 39.1 Battaglia, G.; 等. The radial velocity dispersion profile of the Galactic halo: Constraining the density profile of the dark halo of the Milky Way. Monthly Notices of the Royal Astronomical Society. 2005, 364: 433–442. Bibcode:2005MNRAS.364..433B. arXiv:astro-ph/0506102. doi:10.1111/j.1365-2966.2005.09367.x. ^ Finley, Dave; Aguilar, David. Milky Way a Swifter Spinner, More Massive, New Measurements Show (新闻稿). National Radio Astronomy Observatory. 2009-01-05 [2009-01-20]. （原始内容存档于2014-08-08）. ^ Reid, M. J.; 等. Trigonometric parallaxes of massive star-forming regions. VI. Galactic structure, fundamental parameters, and noncircular motions. The Astrophysical Journal. 2009, 700: 137–148. Bibcode:2009ApJ...700..137R. arXiv:0902.3913. doi:10.1088/0004-637X/700/1/137. ^ Gnedin, O. Y.; 等. The mass profile of the Galaxy to 80 kpc. The Astrophysical Journal. 2010, 720: L108. Bibcode:2010ApJ...720L.108G. arXiv:1005.2619. doi:10.1088/2041-8205/720/1/L108. ^ 43.0 43.1 Peñarrubia, Jorge; 等. A dynamical model of the local cosmic expansion. Monthly Notices of the Royal Astronomical Society: 2204–2022. Bibcode:2014MNRAS.443.2204P. arXiv:1405.0306. doi:10.1093/mnras/stu879. ^ McMillan, Paul J. The mass distribution and gravitational potential of the Milky Way. Monthly Notices of the Royal Astronomical Society. 2017-02-11, 465 (1): 76–94. doi:10.1093/mnras/stw2759. ^ Slobodan Ninković. Mass Distribution and Gravitational Potential of the Milky Way. Open Astronomy. April 2017, 26: 1–6. doi:10.1515/astro-2017-0002. （原始内容存档于2017-04-22）. ^ Phelps, Steven; 等. The Mass of the Milky Way and M31 Using the Method of Least Action. The Astrophysical Journal. October 2013, 775 (2): 12. Bibcode:2013ApJ...775..102P. arXiv:1306.4013. doi:10.1088/0004-637X/775/2/102. 102. ^ Kafle, Prajwal Raj; 等. On the Shoulders of Giants: Properties of the Stellar Halo and the Milky Way Mass Distribution. The Astrophysical Journal. October 2014, 794 (1): 17. Bibcode:2014ApJ...794...59K. arXiv:1408.1787. doi:10.1088/0004-637X/794/1/59. 59. ^ Licquia, Timothy; Newman, J. Improved Constraints on the Total Stellar Mass, Color, and Luminosity of the Milky Way. American Astronomical Society, AAS Meeting #221, #254.11. 2013. Bibcode:2013AAS...22125411L. ^ 49.0 49.1 49.2 The Interstellar Medium. [2015-05-02]. （原始内容存档于2015-04-19）. ^ 50.0 50.1 Lecture Seven: The Milky Way: Gas (PDF). [2015-05-02]. （原始内容存档 (PDF)于2015-07-08）. ^ Frommert, H.; Kronberg, C. The Milky Way Galaxy. SEDS. 2005-08-25 [2007-05-09]. （原始内容存档于2007-05-12）. ^ Wethington, Nicholos. 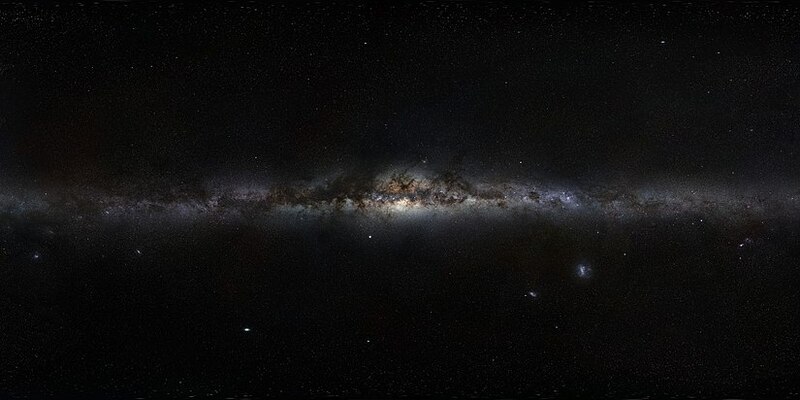 How Many Stars are in the Milky Way?. [2010-04-09]. （原始内容存档于2010-03-27）. ^ Villard, Ray. The Milky Way Contains at Least 100 Billion Planets According to Survey. HubbleSite.org. 2012-01-11 [2012-01-11]. （原始内容存档于2014-07-23）. ^ Young, Kelly. Andromeda Galaxy hosts a trillion stars. NewScientist. 2006-06-06 [2006-06-08]. （原始内容存档于2011-01-05）. ^ 55.0 55.1 Levine, E. S.; Blitz, L.; Heiles, C. The spiral structure of the outer Milky Way in hydrogen. Science. 2006, 312 (5781): 1773–1777. Bibcode:2006Sci...312.1773L. PMID 16741076. arXiv:astro-ph/0605728. doi:10.1126/science.1128455. ^ Dickey, J. M.; Lockman, F. J. H I in the Galaxy. Annual Review of Astronomy and Astrophysics. 1990, 28: 215–259. Bibcode:1990ARA&A..28..215D. doi:10.1146/annurev.aa.28.090190.001243. ^ Savage, B. D.; Wakker, B. P. The extension of the transition temperature plasma into the lower galactic halo. The Astrophysical Journal. 2009, 702 (2): 1472–1489. Bibcode:2009ApJ...702.1472S. arXiv:0907.4955. doi:10.1088/0004-637X/702/2/1472. ^ Sale, S. E.; 等. The structure of the outer Galactic disc as revealed by IPHAS early A stars. Monthly Notices of the Royal Astronomical Society. 2010, 402 (2): 713–723. Bibcode:2010MNRAS.402..713S. arXiv:0909.3857. doi:10.1111/j.1365-2966.2009.15746.x. ^ Coffey, Jerry. Absolute Magnitude. （原始内容存档于September 13, 2011）. ^ Karachentsev, Igor D.; Karachentseva, Valentina E.; Huchtmeier, Walter K.; Makarov, Dmitry I. A Catalog of Neighboring Galaxies. The Astronomical Journal. 2003, 127 (4): 2031–2068. Bibcode:2004AJ....127.2031K. doi:10.1086/382905. ^ Borenstein, Seth. Cosmic census finds crowd of planets in our galaxy. The Washington Post. Associated Press. 2011-02-19. （原始内容存档于2011-02-22）. ^ Sumi, T.; 等. Unbound or distant planetary mass population detected by gravitational microlensing. Nature. 2011, 473 (7347): 349–352. Bibcode:2011Natur.473..349S. PMID 21593867. arXiv:1105.3544. doi:10.1038/nature10092. ^ Free-Floating Planets May be More Common Than Stars. Pasadena, CA: NASA's Jet Propulsion Laboratory. 2011-02-18. （原始内容存档于2011-05-25）. The team estimates there are about twice as many of them as stars. ^ Staff. 17 Billion Earth-Size Alien Planets Inhabit Milky Way. Space.com. 2013-01-07 [2013-01-08]. （原始内容存档于2014-10-06）. ^ Overbye, Dennis. Far-Off Planets Like the Earth Dot the Galaxy. New York Times. 2013-11-04 [2013-11-05]. （原始内容存档于2013-11-05）. ^ Petigura, Eric A.; Howard, Andrew W.; Marcy, Geoffrey W. Prevalence of Earth-size planets orbiting Sun-like stars. Proceedings of the National Academy of Sciences of the United States of America. 2013-10-31, 110: 19273–19278 [2013-11-05]. Bibcode:2013PNAS..11019273P. PMC 3845182. PMID 24191033. arXiv:1311.6806. doi:10.1073/pnas.1319909110. （原始内容存档于2013-11-09）. ^ Borenstein, Seth. Milky Way Teeming With Billions Of Earth-Size Planets. The Associated Press. The Huffington Post. 2013-11-04. （原始内容存档于2014-11-04）. ^ Khan, Amina. Milky Way may host billions of Earth-size planets. Los Angeles Times. 2013-11-04 [2013-11-05]. （原始内容存档于2013-11-06）. ^ Staff. 'Exocomets' Common Across Milky Way Galaxy. Space.com. 2013-01-07 [2013-01-08]. （原始内容存档于2014-09-16）. ^ 71.0 71.1 71.2 Benjamin, R. A. Beuther, H.; Linz, H.; Henning, T., 编. The Spiral Structure of the Galaxy: Something Old, Something New.... Massive Star Formation: Observations Confront Theory 387 (Astronomical Society of the Pacific Conference Series). 2008: 375. Bibcode:2008ASPC..387..375B. See also Bryner, Jeanna. New Images: Milky Way Loses Two Arms. Space.com. 2008-06-03 [2008-06-04]. （原始内容存档于2008-06-04）. ^ 72.0 72.1 Chou, Felicia; Anderson, Janet; Watzke, Megan. RELEASE 15-001 – NASA’s Chandra Detects Record-Breaking Outburst from Milky Way’s Black Hole. NASA. 2015-01-05 [2015-01-06]. （原始内容存档于2015-01-06）. ^ Chen, W.; Gehrels, N.; Diehl, R.; Hartmann, D. On the spiral arm interpretation of COMPTEL ^26^Al map features. Space Science Reviews. 1996, 120: 315–316. Bibcode:1996A&AS..120C.315C. ^ McKee, Maggie. Bar at Milky Way's heart revealed. New Scientist. 2005-08-16 [2009-06-17]. （原始内容存档于2014-10-09）. ^ 77.0 77.1 Kiss, Cs; Moór, A.; Tóth, L. V. Far-infrared loops in the 2nd Galactic Quadrant. Astronomy and Astrophysics. April 2004, 418: 131–141. Bibcode:2004A&A...418..131K. arXiv:astro-ph/0401303. doi:10.1051/0004-6361:20034530. ^ 78.0 78.1 Lampton, M., Lieu, R.; 等. 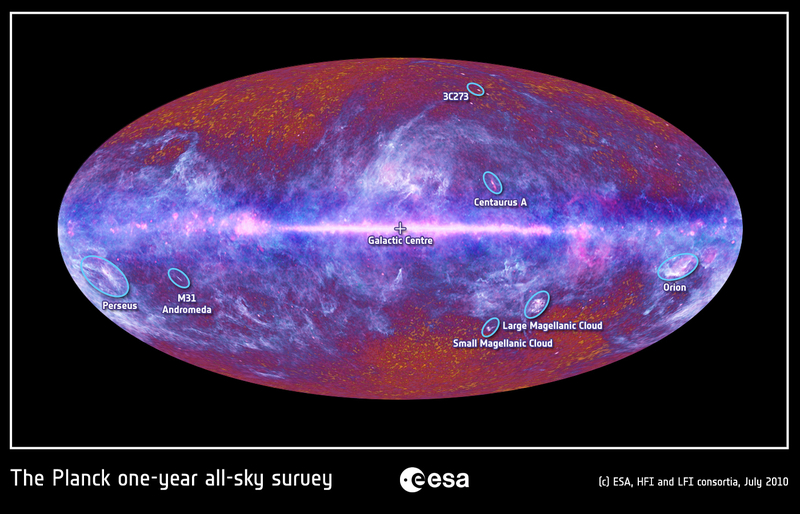 An All-Sky Catalog of Faint Extreme Ultraviolet Sources. The Astrophysical Journal Supplement Series. February 1997, 108 (2): 545–557. Bibcode:1997ApJS..108..545L. doi:10.1086/312965. ^ van Woerden, Hugo; Strom, Richard G. The beginnings of radio astronomy in the Netherlands (PDF). Journal of Astronomical History and Heritage. June 2006, 9 (1): 3–20. Bibcode:2006JAHH....9....3V. （原始内容存档 (PDF)于2010-09-19）. ^ Boehle, A.; Ghez, A. M.; Schödel, R.; Meyer, L.; Yelda, S.; Albers, S.; Martinez, G. D.; Becklin, E. E.; Do, T.; Lu, J. R.; Matthews, K.; Morris, M. R.; Sitarski, B.; Witzel, G. AN IMPROVED DISTANCE AND MASS ESTIMATE FOR SGR A* FROM A MULTISTAR ORBIT ANALYSIS. The Astrophysical Journal. 2016-10-03, 830 (1): 17. doi:10.3847/0004-637X/830/1/17. ^ Gillessen, Stefan; Plewa, Philipp; Eisenhauer, Frank; Sari, Re'em; Waisberg, Idel; Habibi, Maryam; Pfuhl, Oliver; George, Elizabeth; Dexter, Jason; von Fellenberg, Sebastiano; Ott, Thomas; Genzel, Reinhard. An Update on Monitoring Stellar Orbits in the Galactic Center. 2016-11-28. arXiv:1611.09144. ^ Reid, M. J.; 等. A trigonometric parallax of Sgr B2. The Astrophysical Journal. November 2009, 705 (2): 1548–1553. Bibcode:2009ApJ...705.1548R. arXiv:0908.3637. doi:10.1088/0004-637X/705/2/1548. ^ 83.0 83.1 Vanhollebeke, E.; Groenewegen, M. A. T.; Girardi, L. Stellar populations in the Galactic bulge. Modelling the Galactic bulge with TRILEGAL. Astronomy and Astrophysics. April 2009, 498: 95–107. Bibcode:2009A&A...498...95V. doi:10.1051/0004-6361/20078472. ^ 84.0 84.1 84.2 84.3 Majaess, D. Concerning the Distance to the Center of the Milky Way and Its Structure. Acta Astronomica. March 2010, 60 (1): 55. Bibcode:2010AcA....60...55M. arXiv:1002.2743. ^ Grant, J.; Lin, B. The Stars of the Milky Way. Fairfax Public Access Corporation. 2000 [2007-05-09]. （原始内容存档于2007-06-11）. ^ Shen, J.; Rich, R. M.; Kormendy, J.; Howard, C. D.; De Propris, R.; Kunder, A. Our Milky Way As a Pure-Disk Galaxy—A Challenge for Galaxy Formation. The Astrophysical Journal. 2010, 720: L72. Bibcode:2010ApJ...720L..72S. arXiv:1005.0385. doi:10.1088/2041-8205/720/1/L72. ^ Jones, Mark H.; Lambourne, Robert J.; Adams, David John. An Introduction to Galaxies and Cosmology. Cambridge University Press. 2004: 50–51. ISBN 0-521-54623-0. ^ 88.0 88.1 Ghez, A. M.; 等. Measuring distance and properties of the Milky Way's central supermassive black hole with stellar orbits. The Astrophysical Journal. December 2008, 689 (2): 1044–1062. Bibcode:2008ApJ...689.1044G. arXiv:0808.2870. doi:10.1086/592738. ^ 89.0 89.1 Wang, Q. D.; Nowak, M. A.; Markoff, S. B.; Baganoff, F. K.; Nayakshin, S.; Yuan, F.; Cuadra, J.; Davis, J.; Dexter, J.; Fabian, A. C.; Grosso, N.; Haggard, D.; Houck, J.; Ji, L.; Li, Z.; Neilsen, J.; Porquet, D.; Ripple, F.; Shcherbakov, R. V. Dissecting X-ray-Emitting Gas Around the Center of Our Galaxy. Science. 2013, 341 (6149): 981–983. Bibcode:2013Sci...341..981W. PMID 23990554. arXiv:1307.5845. doi:10.1126/science.1240755. ^ Blandford, R. D. Origin and Evolution of Massive Black Holes in Galactic Nuclei. Galaxy Dynamics, proceedings of a conference held at Rutgers University, ASP Conference Series. Rutgers University. 8–12 August 1998 (August 1999). Bibcode:1999ASPC..182...87B. arXiv:astro-ph/9906025. ^ Frolov, Valeri P.; Zelnikov, Andrei. Introduction to Black Hole Physics. Oxford University Press. 2011: 11, 36. ISBN 0199692297. （原始内容存档于2016-08-10）. ^ Cabrera-Lavers, A.; 等. 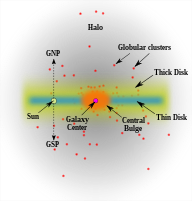 The long Galactic bar as seen by UKIDSS Galactic plane survey. Astronomy and Astrophysics. December 2008, 491 (3): 781–787. Bibcode:2008A&A...491..781C. arXiv:0809.3174. doi:10.1051/0004-6361:200810720. ^ Nishiyama, S.; 等. A distinct structure inside the Galactic bar. The Astrophysical Journal. 2005, 621 (2): L105. Bibcode:2005ApJ...621L.105N. arXiv:astro-ph/0502058. doi:10.1086/429291. ^ Alcock, C.; 等. The RR Lyrae population of the Galactic Bulge from the MACHO database: mean colors and magnitudes. The Astrophysical Journal. 1998, 492 (2): 190–199. Bibcode:2005ApJ...621L.105N. arXiv:astro-ph/0502058. doi:10.1086/305017. ^ Kunder, A.; Chaboyer, B. Metallicity analysis of Macho Galactic Bulge RR0 Lyrae stars from their light curves. The Astronomical Journal. 2008, 136 (6): 2441–2452. Bibcode:2008AJ....136.2441K. arXiv:0809.1645. doi:10.1088/0004-6256/136/6/2441. ^ Staff. Introduction: Galactic Ring Survey. Boston University. 2005-09-12 [2007-05-10]. （原始内容存档于2007-07-13）. ^ Bhat, C. L.; Kifune, T.; Wolfendale, A. W. A cosmic-ray explanation of the galactic ridge of cosmic X-rays. Nature. 1985-11-21, 318 (6043): 267–269. Bibcode:1985Natur.318..267B. doi:10.1038/318267a0. ^ Overbye, Dennis. Bubbles of Energy Are Found in Galaxy. The New York Times. 2010-11-09. （原始内容存档于2016-01-10）. ^ NASA's Fermi Telescope Finds Giant Structure in our Galaxyl. NASA. [2010-11-10]. （原始内容存档于2014-08-23）. ^ Carretti, E.; Crocker, R. M.; Staveley-Smith, L.; Haverkorn, M.; Purcell, C.; Gaensler, B. M.; Bernardi, G.; Kesteven, M. J.; Poppi, S. Giant magnetized outflows from the centre of the Milky Way. Nature. 2013, 493 (7430): 66–69. Bibcode:2013Natur.493...66C. PMID 23282363. arXiv:1301.0512. doi:10.1038/nature11734. ^ Churchwell, E.; 等. The Spitzer/GLIMPSE surveys: a new view of the Milky Way. Publications of the Astronomical Society of the Pacific. 2009, 121 (877): 213–230. Bibcode:2009PASP..121..213C. doi:10.1086/597811. ^ Dame, T. M.; Hartmann, D.; Thaddeus, P. The Milky Way in Molecular Clouds: A New Complete CO Survey. The Astrophysical Journal. 2001, 547 (2): 792–813. Bibcode:2001ApJ...547..792D. arXiv:astro-ph/0009217. doi:10.1086/318388. ^ Taylor, J. H.; Cordes, J. M. Pulsar distances and the galactic distribution of free electrons. The Astrophysical Journal. 1993, 411: 674. Bibcode:1993ApJ...411..674T. doi:10.1086/172870. ^ 104.0 104.1 104.2 Russeil, D. Star-forming complexes and the spiral structure of our Galaxy. Astronomy and Astrophysics. 2003, 397: 133–146. Bibcode:2003A&A...397..133R. doi:10.1051/0004-6361:20021504. ^ 105.0 105.1 105.2 Majaess, D. J.; Turner, D. G.; Lane, D. J. Searching Beyond the Obscuring Dust Between the Cygnus-Aquila Rifts for Cepheid Tracers of the Galaxy's Spiral Arms. The Journal of the American Association of Variable Star Observers. 2009, 37: 179. Bibcode:2009JAVSO..37..179M. arXiv:0909.0897. ^ Lépine, J. R. D.; 等. The spiral structure of the Galaxy revealed by CS sources and evidence for the 4:1 resonance. Monthly Notices of the Royal Astronomical Society. 2011, 414 (2): 1607–1616. Bibcode:2011MNRAS.414.1607L. arXiv:1010.1790. doi:10.1111/j.1365-2966.2011.18492.x. ^ 107.0 107.1 Drimmel, R. Evidence for a two-armed spiral in the Milky Way. Astronomy & Astrophysics. 2000, 358: L13–L16. Bibcode:2000A&A...358L..13D. arXiv:astro-ph/0005241. ^ McClure-Griffiths, N. M.; Dickey, J. M.; Gaensler, B. M.; Green, A. J. A Distant Extended Spiral Arm in the Fourth Quadrant of the Milky Way. The Astrophysical Journal. 2004, 607 (2): L127. Bibcode:2004ApJ...607L.127M. arXiv:astro-ph/0404448. doi:10.1086/422031. ^ Benjamin, R. A.; 等. First GLIMPSE results on the stellar structure of the Galaxy. The Astrophysical Journal. 2005, 630 (2): L149–L152. Bibcode:2005ApJ...630L.149B. arXiv:astro-ph/0508325. doi:10.1086/491785. 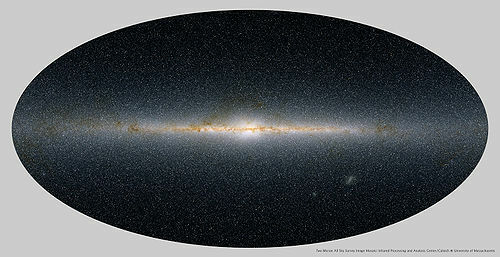 ^ "Massive stars mark out Milky Way's 'missing' arms" 互联网档案馆的存檔，存档日期2013-12-18., University of Leeds. December 17, 2013. Retrieved December 18, 2013. ^ Westerholm, Russell. Milky Way Galaxy Has Four Arms, Reaffirming Old Data and Contradicting Recent Research. University Herald. 2013-12-18 [December 18, 2013]. （原始内容存档于2013-12-19）. ^ 112.0 112.1 Urquhart, J. S.; Figura, C. C.; Moore, T. J. T.; Hoare, M. G.; 等. The RMS Survey: Galactic distribution of massive star formation. Monthly Notices of the Royal Astronomical Society. January 2014, 437 (2): 1791–1807. Bibcode:2014MNRAS.437.1791U. arXiv:1310.4758. doi:10.1093/mnras/stt2006. ^ 114.0 114.1 Dame, T. M.; Thaddeus, P. A New Spiral Arm of the Galaxy: The Far 3-Kpc Arm. The Astrophysical Journal: L143–L146. Bibcode:2008ApJ...683L.143D. arXiv:0807.1752. doi:10.1086/591669. ^ Milky Way's Inner Beauty Revealed. Harvard-Smithsonian Center for Astrophysics. 2008-06-03 [2015-07-07]. （原始内容存档于2013-07-05）. ^ Matson, John. Star-Crossed: Milky Way's Spiral Shape May Result from a Smaller Galaxy's Impact. Scientific American. 2011-09-14 [2015-07-07]. （原始内容存档于2013-12-03）. ^ Mel'Nik, A.; Rautiainen, A. Kinematics of the outer pseudorings and the spiral structure of the Galaxy. Astronomy Letters. 2005, 35 (9): 609–624. Bibcode:2009AstL...35..609M. arXiv:0902.3353. doi:10.1134/s1063773709090047. ^ Mel'Nik, A. Outer pseudoring in the galaxy. Astronomische Nachrichten. 2005, 326: 599. Bibcode:2005AN....326Q.599M. arXiv:astro-ph/0510569. doi:10.1002/asna.200585006. ^ Lopez-Corredoira, M.; 等. Comments on the "Monoceros" affair. July 2012. arXiv:1207.2749. ^ Astronomy Lecture Notes 互联网档案馆的存檔，存档日期2006-09-14. ^ Ibata, R.; 等. On the accretion origin of a vast extended stellar disk around the Andromeda Galaxy. The Astrophysical Journal. 2005, 634 (1): 287–313. Bibcode:2005ApJ...634..287I. arXiv:astro-ph/0504164. doi:10.1086/491727. ^ Outer Disk Ring?. SolStation. [2007-05-10]. （原始内容存档于2007-06-02）. ^ Reid, M. J. (1993), "至銀河中心的距離". Annual Review of Astronomy and Astrophysics, Vol. 31, p. 345-372. ^ Eisenhauer, F., et al (2003), "以幾何學測量至銀河中心的距離" Astrophys.J. 597 L121-L124. ^ Horrobin, M. et al (2004), "First results from SPIFFI. I: The Galactic Center" 互联网档案馆的存檔，存档日期2007-06-21. (PDF). Astronomische Nachrichten, Vol. 325, p. 120-123. ^ English, Jayanne. Exposing the Stuff Between the Stars. Hubble News Desk. 2000-01-14 [2007-05-10]. （原始内容存档于2007-07-07）. ^ Glenn Elert. Period of the Sun's Orbit around the Galaxy (Cosmic Year). hypertextbook.com. 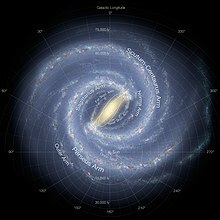 ^ Milky Way Galaxy: Facts About Our Galactic Home. Space.com. [2017-04-08]. （原始内容存档于2017-03-21）. ^ Shapley, H.; Curtis, H. D. The Scale of the Universe. Bulletin of the National Research Council. 1921, 2: 171–217. Bibcode:1921BuNRC...2..171S. ^ Lada, C J. Stellar multiplicity and the IMF: most stars are single. Astrophys J Lett. 2006, (640): L63–L66. ^ Dave Finley. Massive Gas Cloud Speeding Toward Collision With Milky Way. NRAO. [2008-01-14].